I know I said this last time... I need to set reminders or something... But now to fill you in on as much of the last 12 months that I can recall off the top of my hat! 2017 has been a whirlwind. We have met so many lovely dogs, and have placed all these beautiful souls into loving homes. We have had to organise a few behaviour consultations post-adoptions, but given that our relationship with our adopted homes doesn't end with the trial, it is something we are happy to help with at any point. One thing I often despair about is how much a dogs behaviour changes post adoption. It's very interesting to watch - for example, we always run in a small "pack" - pack being an outdated term as dogs are now a part of our family units, but I do like the term of pack as a collective noun only. While in foster care, it is unusual for a dog to not get a long with its "packmates". Then we find that post adoption, regardless of the effort we put into reference checks, house checks, pre-adoption socialisation, the shift in pack dynamics will make for a totally different dog. These things need to be monitored carefully by the new home, and we can help where possible to correct undesirable behaviour, but it takes patience, dedication and everyone being on the same page in the new home. Our dogs need stability and consistency to be the best dogs they can be and that starts at home. On the positive side though, the majority of our adoptions have been wonderfully bump in the road free. Most recently we placed Yazi, our beautiful Lost Dogs Home girl into a lovely home in Tasmania, where she is kicking goals and winning hearts daily! Then there has been one of our mercy missions, Able who arrived weighing only 3.5kg! He is now living it up in the May household, with other cresties to crest all over the shop with. Not forgetting all the other precious paws that we helped this year - with your assistance as our supporters. We had a great time at the 2017 Dog Lovers Show, which was Marlon's first. Nelson came along. and he's still plodding along at almost 15 years of age. The biggest news we have for the tail end of this year is our Calendar - it is chock full of everything you want in a calendar... dates, squares to write in. Photos of Chinese Cresteds too... for charity... we'll post more info when details become available. We're also organising a movie night - an outdoor session so our dog friends can come along! How very exciting... Check out the details below. We're very excited to bring this to you. You can catch us in the flesh at the Knox Pets In The Park on November 19th at Gilbert's Reserve and also on December 8th at KCC Dog Park for the annual Dogs Big Day Out and Christmas Market. Sorry for the delay in entries! 2016 has been busy... And challenging... And, for some of it, downright depressing. If you've been following our brief Facebook updates, you'd have seen we had been tested with two pups that were surrendered to rescue after contracting the dreaded parvovirus. We were able to save our little man, Ferdinand. However his smaller, weaker sister succumbed and we lost her. She was cremated and returned to our home. Although we lost sweet little Hettie, Ferdinand pulled through. He got healthy enough to find a home in May... we just caught up with him only a few weeks ago and he has flourished into a beautiful young dog. One of the first dogs we ever rehomed Kelly (who lived her new life as Shelley) was also eased into her next life after a long and brave fight with insulinoma... a vicious cancer of the pancreas. Her darling mumma was very strong to make the final call, as Shelley was no longer Shelley. We also lost our own beautiful girl, Holly. She was diagnosed with a condition called Sudden Acquired Retinal Degeneration Syndrome - she was robbed of her sight over four short days. Holly went under a series of diagnostic testing to have it confirmed. She did not cope well and was on the verge of injuring her useless eyes, so we had them removed. We changed our routines to help Holly, to keep her safe and help her transition. For a month or so, she rallied and gave us every indication that she would adapt to being a blind dog. That was until we installed cameras to see what the dogs got up to during the day. Looking over daily footage we saw how traumatising leaving Holly on her own had become. Without us there to guide her through the day, she was truly a wreck. We did lots of behaviour conditioning, tried anxiety medications and a few other things, however it wasn't easing her at all. Our once fierce, complicated, pack matriarch was a shell of her former self. After speaking with Steve, the vet, her breeder, her handler... we decided that the kindest thing we could do was spoil her rotten and have the vet send her to her next life. So for one beautiful week, she spent every waking moment with us. She ate everything her little heart desired... she ate pizza, quiche, scotch fillet, breakfast muffins, McDonald's hot apple pies, cheeseburgers and chips. Her last moment was spent in Steve's arms with her mouth in a bowl of pulled pork and as she licked the last bits from her face, she fell into her long sleep. It couldn't have been a better passing if we tried. On happier news, the time we spent at the Dog Lovers Show in Melbourne was amazing. We spent so much time chatting with like minded rescues, educating the public on our rescue and this sweet little breed. And one of our boys, Paco, was able to find a lovely home by meeting His People there. It was an instant attraction and love at first sight. In June, thanks to the crafty work of my "proud as punch" Dad, we were able to get a sneaky spot in the Herald Sun newspaper, based on the punny name of our rescue... and the correlation between No Hairs Ark, caring for and rehoming hairless dogs in The Patch was noted! Having never realised this before, it was a bit of a light bulb moment! In August, the RSPCA conducted a raid and seized 120 odd dogs from a rural Victorian property. Of that 120, were dozens and dozens of Chinese Crested dogs. Naturally we put a hand up and offer our help - this resulted in one Chinese Crested, an English Toy Terrier and one little cross breed being handed over to No Hairs Ark. We had been able to work with Wilma the CC and BoJack, the ETT, however the little cross that we dubbed Tucky was far too traumatised for our care, and she went back to the RSPCA to be placed with a carer that had a much quieter home and only one dog, to give Tuck the love and care in a home that she could flourish in. In the coming months, you will notice a huge influx of Chinese Crested dogs in rescue groups looking for homes. Most of these dogs will be a product of the raid and although lots of work has gone into them, they will require extra love and understanding while they settle into new homes. In conclusion, in our care, we currently have a busy handful of dogs. They are with a devoted team of the best foster carers. We are also working toward obtaining our charity status to help with fundraising and the like. So we continue to march on, accomplishing more and more as a great little team. Thanks for reading, our dear followers. Hi there and welcome to another of No Hairs Ark’s blogs – we hope you and your puppers have been well! Okay – where to start…? What a time we’ve had in the last month – we left you with the news that we’d be having our first big day out, which was AWESOME, but very hot. There was lots of media coverage and our Holly even got in the Herald Sun, pictured alongside Breeze who met her new mum and went to her forever home at the end of the day. We met so many people along with the Melbourne Chinese Crested Club. With everything we sold at the market, we were able to raise about $280 for the No Hairs Ark veterinary bill. We learnt a lot being our first stall, so we’re looking forward to having a few more in the future, with an awesome selection of homemade goodies from irresistable pupper snacks, scented TahKayla soy wax candles, exclusive designs from Whippet and Moo dapper dog collars and more! We also introduced you to Oxford and Illy – a bonded father and daughter Chinese Crested pigeon pair. Both dogs had the needed and necessary vet work (only desexing and a dental for Illy and a big old dental for Ox leaving him more bark than bite!) and after that, we got ready to list them for adoption – suddenly Illy developed a mammary lump which needed a swift removal and Ox started a soft coughing, which needed a series of x-rays. Illy’s lump turned out benign and Ox’s cough was me being an over concerned mama bear. Sometimes I just can't help it, but we'd much rather be safe than sorry when it comes to the health and livelihood of our beautiful charges. A week later we booked them in for a groom at Croydon Discount Dog Grooming (seriously, call Helena if you're in the area, she's great!) to then go and capture some great shots for their adoption profiles, however something really bad happened to Oxford and this is where our blog goes a bit sad. Here is Ox's neck - arrows point to the calcification and subsequent location of the herniation. On Wednesday 16th, Ox started crying randomly and carrying his head really low – then he started not even wanting to walk or lay with us on the bed. We took him to the vet for a check-up and she agreed he was very sore. We tried him on a liquid painkiller and anti-inflammatory called Loxicom. There was no luck with that and on the Friday he was even worse. Another check-up meant more x-rays for Ox which revealed some calcification to his neck and we were sent home with Tramadol and Delta Cortef to start in the morning. Fast forward to the next Tuesday and Oxo was actually worse – he was crying at the tiniest breeze and it was rather guttural now and we had been forced to syringe feed him for the past 3 days. We booked in with a specialist at Pet Emergency and Specialist Centre named Dr. Chris Preston. Chris had us in the next day, first thing and Oxo was given another general anaesthetic and popped through a CT scan. The CT scan confirmed something we dreaded – a massively herniated disk. Ox needed surgery to save his life and it wouldn’t come cheap. But he was under anaesthetic and we needed to make a decision then and there. Oxford's CT scans - we have circled the problematic herniation. 1. Wake him up and hospice nurse him until the end. 2. Not wake him up and let him go while he was under. 3. Surgery at that moment. Myself, I was in tears, while Steve was stuck being the pragmatic head of the rescue. Surgery would mean the rescue would be put back several thousand dollars and would ultimately see us with a cleared out bank account (both the rescue and our personal account) – but we knew Ox was a beautiful dog that would make someone very happy – he was only 7 and still had so much more life to live – so we went with the surgery. We said our goodbyes to Oxford, who was still in lala land, as we had to leave him there overnight, which was tough in itself. However it seemed as if we were only down the street (in reality over 2 hours had passed) and we got the phone call - all was done and Ox was already conscious and sitting upright! What a trooper! So it was a great success - even the specialist was surprised at the amount of fluid he took out of Oxford! And better yet, we were told we were able to bring him home the next day on Christmas Eve – having him back is like a Christmas miracle. But as I mentioned, even though Chris Preston was amazingly generous to us, it took a huge toll on the rescue as our emergency funds are now gone and our veterinary bill at our regular clinic is getting all kinds of crazy. Thanks to PESC, Oxo (now at home sleeping soundly - morphine is an amazing thing) has many happy years ahead of him - but we desperately need donations as his specialist surgery wiped us out. But to end on a happy note – during the time that Oxford took unwell, we were able to place Illy in a foster home where she could work on becoming an independent little Crestie that didn’t need her dad around – she’s flourished in Jan’s care and I’m happy to say when she is ready, we can certainly look into rehoming her without Oxford. More on that in the New Year. Oh, and finally – No Hairs Ark wishes you a very Merry Christmas and a Happy New Year – remember not to let your puppers into the human food and stay safe during any fireworks. Thank you for all your support and see you in 2016! Merry "Take This Off Me RIGHT NOW"-mas from the girls of No Hairs Ark - representatives Tonks, Holly and Pew, from Left to Right. Hello and welcome to the first of our monthly blogs. These are designed with a couple of reasons in mind – to give you an idea of what we’re doing, who we have in care and what we have coming up. I wish we had of thought to do these sooner, as we’re hoping it also allows you get to know the people behind the rescue. Laura having a moment with the boys - this is the first time the boys have seen her since they were 14-16 weeks old - they remembered her well! It’s usually always taking a day at a time here and hitting the ground running, but November has been an especially busy month for us – we have had two photoshoots (two very awesome themes which are still under wraps at the moment) and we also hosted our first reunion party for a Chinese Crested x Border Collie litter we dubbed “The Science Pups” as they all were given the name of an influential scientific mind. There was Hawking, Edison, Tesla, Lovelace and Fossey. Puppy cupcakes for the guests, but the puppies had thier own pupcakes to eat! It was held on November 28th, the pups first birthday. We got together at Diggiddy Doggy Daycare in South Melbourne and for a few hours let the boys reunite and play – it was great to see the dogs recognise each other and lark about like they did as pups. Hawking (who is now known as Harvey Buster) was sporting a beautiful summer clip, while Edison and Tesla were as naked as the day they were born. There was cupcakes for the kids and some party activities, lots of food for the guests and a LOT of food suitable for the dogs – the pups went home with a party bag full of treats like a pigs ear, Greenie sticks, Diamond Dogs Bakery bikkies and a pupcake of their own. The owners got a copy of their first picture at 7 weeks old and the last known group shot of the pups from their first photoshoot. We had such a great time organising the day, we’d love to have another get together in a few years – maybe with an extended guest list next time with all our rehomed dogs… we might need a bigger venue! We have two beautiful Chinese Crested dogs in care at the moment – a lovely father and daughter duo by the name of Oxford (the dad) and Illy (the daughter). Oxford is estimated at about 8 years old and Illy is about 4 years old. They are very bonded and we’d love to see them rehomed together, however at the current moment they are not available for adoption as we’re trying to trial how they go on their own as well as sort out a few medical things with their skin. But for now, I can assure you they are a lovely lot of dogs – Oxford loves a good scratch (as does Illy) and both are very spritely in the yard when it comes to running about with each other. 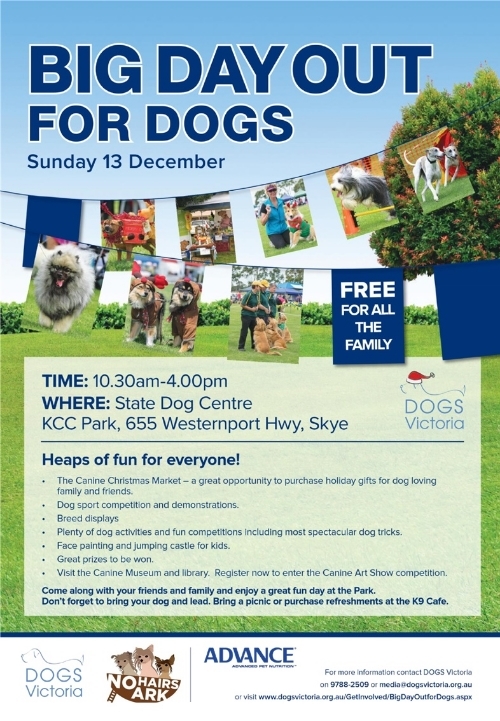 This coming December we can look forward to having our first market stall at the VicDogs Dog Day Out – this will be on December 13th at the KCC Dog Park in Skye and you can see us there from 10:30am onwards. We’re hoping to stock some market specials like doggy cooling mats, some dog collars, candles, clothing and lots of homemade dog treats to raise funds for the rescue. Bring your dog (and a lead!) as well as your family and a picnic lunch - we are really looking forward to seeing you there! Finally, we also have running our GoFundMe Fundraiser, which we have just hit the halfway point - if you'd like to check it out, share or donate, the link is on our homepage, or you can click here share and donate! Thanks for reading and we look forward to updating you again in the near future.